A group of residents are “disappointed and dismayed” that no DublinBikes station is currently included at Phibsborough village as part of a planned mini-expansion of the scheme around Dublin Institute of Technology (DIT) in Grangegorman. IrishCycle.com were the first to report in July that there would be an expansion of Dublin’s public bicycle share system around the new DIT campus in Grangegorman. This weekend, a local residents’ group, Phizzfest Reimagining Phibsborough, have said that they are objecting to the lack of a station in their area. The group describes its self as a campaign for improved pedestrian and cyclist safety and sense of place for the village of Phibsborough. “Phizzfest Reimagining Phibsborough is disappointed and dismayed to be notified by the National Transport Authority (NTA) that the current proposed expansion of the Dublin Bikes scheme to Phibsborough and environs contains not a single stand in the village or north of the North Circular Road, as the attached visual of proposed stands shows,” the group said on Facebook. 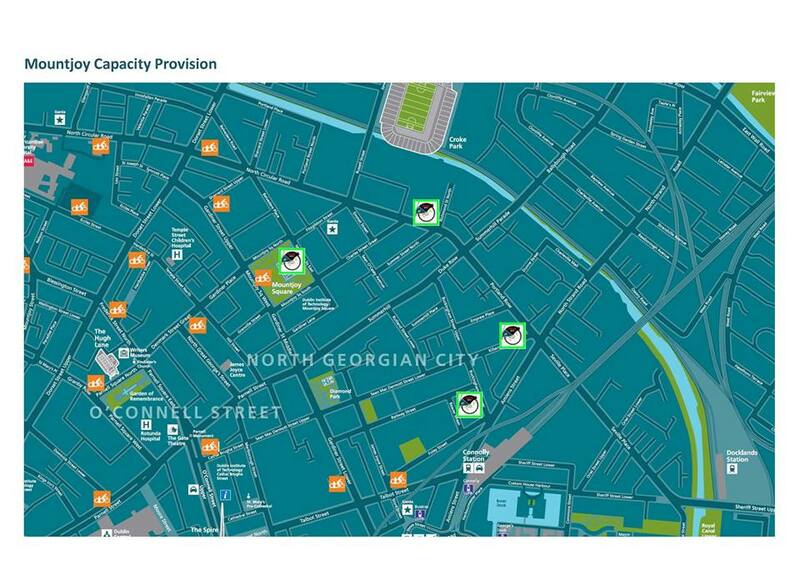 The map uploaded by the group, which they say is from the National Transport Authority, shows 11 possable new station locations (marked as icons with bright green borders) around the new third level campus Grangegorman, where construction is ongoing to move most DIT students to the one campus. Another four stations are planned as a ‘capacity increase’ in the area between Mountjoy Square and Connolly Station (see the second map at the bottom of this article). According to this website’s reading of the map, the locations along the North Circular Road north of Grangegorman, amount to a skipping over of Phibsborough village but also a skipping over of the residential and village centre areas along Stoneybatter and Manor Street, located to the west of the Grangegorman campus. “We reject this out of hand and will be asking the NTA to overturn this decision. We will be applying pressure and seeking the support of all local representatives to ensure this happens and that the scheme expansion includes the village centre – in line with the southside equivalents (Grand Canal including dock, Ranelagh, Rathmines),” said Phizzfest Reimagining Phibsborough.